Crystal House project you can find on the Golden Stage listing since 20th of February with $400 reinvestment. I must say already that project looks so good that I would not like to see in any other position apart from Golden Stage. The project looks serious, but at the same time basic what makes it enjoyable for a big part of HYIP investors. 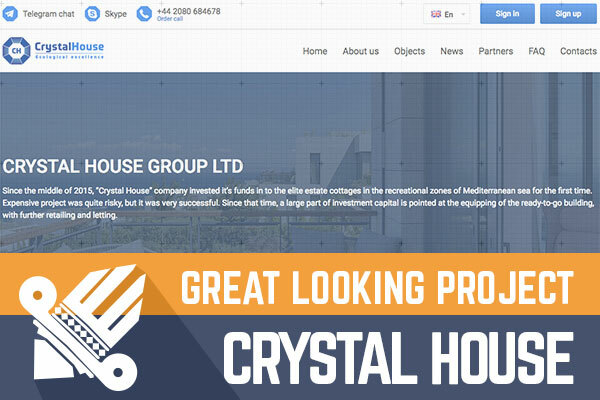 If you would like to know more about Crystal House simply read further. Well, what can I say - from a design point of view this is one of the best projects that I have seen around lately. Everything is nicely designed and well structured. Each page is quite informative, and the best thing is that there is not too much information and that simply keeps this project basic even for people that have arrived at this industry for the first time. All content is available in three languages - English, Russian and German. I'm happy about that simply because lately there is an expanding German community in this industry. There always has been many Germans in this industry, but these days seems that they are active more than ever. 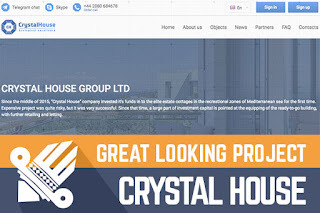 I like that on the homepage with three simple steps is explained the whole process what is going on with Crystal House project and I see that also administrator is quite active when it comes to news and activities with the project. I do not see any social media activity, but it is highly possible that it will come later and that is nothing bad after all. The only thing that rejects me from this project is a video presentation. If a designer draws a position where video presentation should be then, it should be great and should generate additional interest for investors. But this time administrator with this video has done opposite thing when you watch this zero budget video you simply do not like this project that much anymore. Even videos that have been ordered from fiverr.com looks way better. I hope administrator will fix this error because it simply does not look good when all other details are done so well. Talking about investment plans, there are two options to choose from. The first option will pay 5.35% daily for 30 calendar days, and you will be able to make 60.5% profit within a month. The second option will pay one payment exactly after ten days, and you will receive 109% return, from that 9% will be your pure profit. If personally than I would choose the first option. You will be able to invest with Perfect Money, AdvCash, Payeer and cryptocurrency Bitcoin. One more beautiful thing - all payments will be paid instantly. In short, the project is great, it looks, and it is great. Of course, I would like that it would look way better, but I'm sure that administrator will act fast and he will order some nice new video presentation because without it project is not complete. If you plan to invest, I can say that for now, the project is quite fresh and you know there is a saying "strike the iron while it is hot" because later it can be too late. Of course, remember that this is still an HYIP and it can close even tomorrow, so invest only that you can afford to lose. Investment plans: 5.35% daily for 30 days, initial deposit included in the payments. 109% return after 10 days, initial deposit included in the payment.